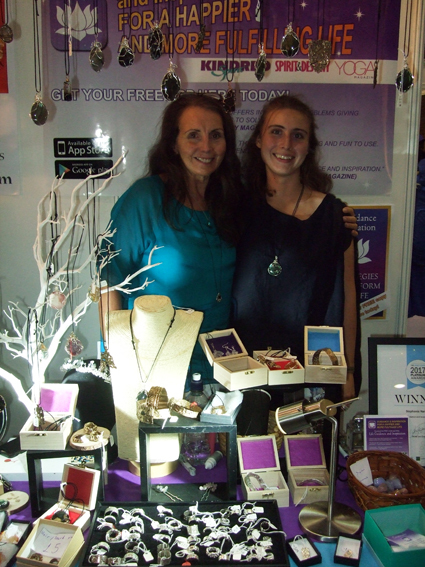 I always love going to the Mind Body Soul Experience in London - it has a huge number and wide variety of stalls to browse, interesting workshops and it is in the beautiful venue of Alexandra Palace. Now, I know a lot of pagans give this festival a miss because it isn't exclusively a pagan event like Witchfest, but that's rather what appeals to me. I get to try out a lot of things I might not otherwise have done. 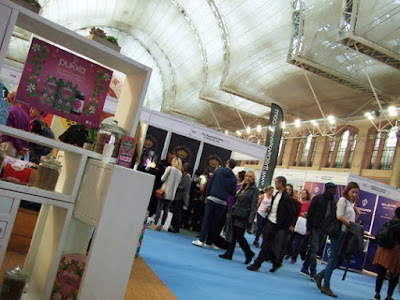 The event even runs alongside a yoga show and a ticket for one lets you enjoy the other as well. So, you can have a go at yoga as well as things like exploring your past lives, learning about numerology or meditating to singing bowls. 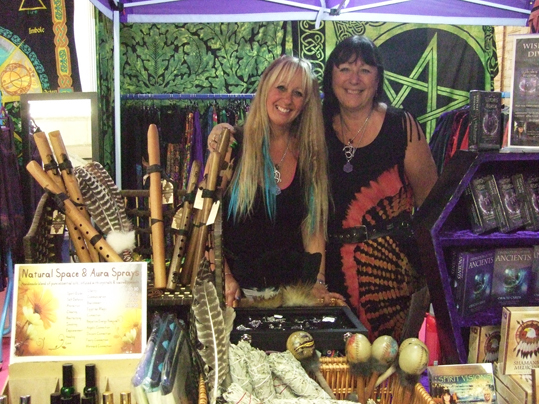 The picture at the top shows the stall run by my fellow Moon Books authors Barbara Meiklejohn-free and Flavia Kate Peters, who were selling lovely clothes, divination decks, drums and rattles as well as copies of their books, including The Book of Destiny, which is a rather unusual divination system where you simply open a page to get an intriguing message. Another book I was was really tempted to buy was the One Year Wiser gratitude journal, in which you are encouraged to record lovely things that happen to you throughout the year that you are grateful for. I didn't, because I actually put my thoughts into my blog already, but a friend I was with bought a copy. 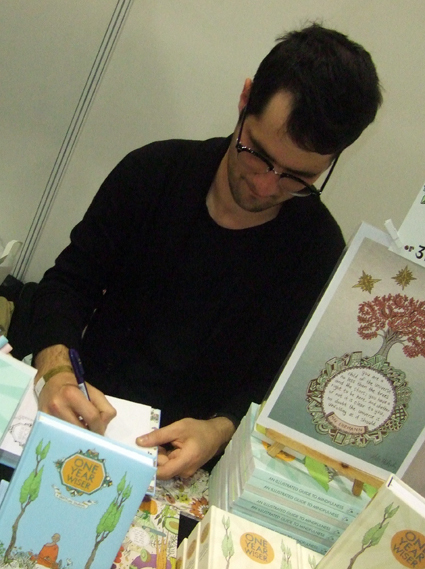 You can see the author, Mike Medaglia, signing it for her and also drawing a lovely picture in the front (above right). If you are interested, you can view the One Year Wiser gratitude journal on Amazon. The photo to the left shows Stephanie Harrison and her daughter Alicia. I went to an inspiring workshop run by Stephanie called The Sacred Journey of the Soul. This included two guided visualisations to help you explore the cycles or spirals of life that we all go through - often many times. She described this as following six stages, which we visualised first as a seed growing to a mature tree, then as a path we might follow. 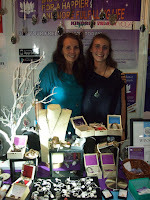 My favourite discovery at the event were the hand-painted soul stones by Alexis. I blogged in full about her stones on Sunday, but I thought I'd show another photo of one of her creations here. 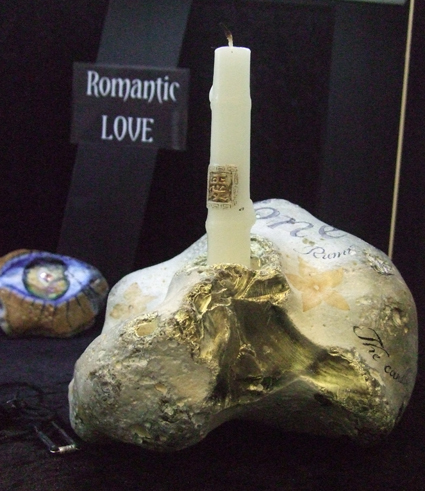 It is a stone that forms a natural candle holder and has also been beautifully painted. I was quite tempted to buy it as well as the small stone I did get - candle magic is, after all, one of my favourite types of magic. I took the picture at the bottom while resting in a hammock by the Pukka tea stall. There are always lots of interesting things to eat and drink at the Mind Body Soul Experience.